You can find prayers and more information on our myParish App. Download it on your Apple or Android today! 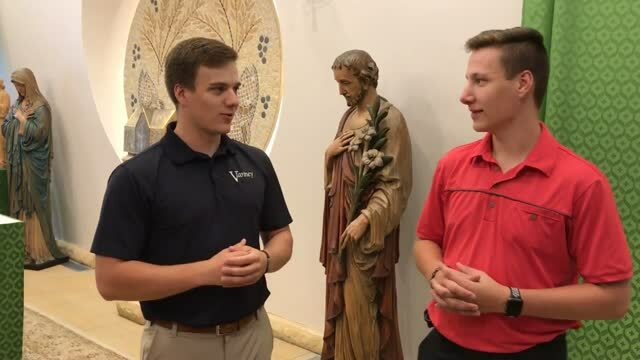 This video was from our Vocations Benefit Dinner hosted by the Knights of Columbus last month. This benefit was for all the Seminarians in the Diocese of Grand Rapids, not simply our own. Enjoy this little glimpse into the formation of our guys and please keep them in your prayers. Takes place on every first Thursday of the Month at Sacred Heart Parish in Grand Rapids, MI. Refreshments begin at 6:30 p.m. and lectures begin at 7:00 p.m. More info here. Authenticum seeks to awaken as many people as possible to the Truth, Beauty, and Goodness of the Catholic Faith by sponsoring ongoing exciting lectures on the humanities (history, literature, music, philosophy, liturgy, patristics, theology, catechesis, etc.) in the spirit of Philippians 4:8. All Authenticum Lectures are approved for Catechist Certification Credit in the Diocese of Grand Rapids, MI. Traveling? Find Mass times within the Diocese of Grand Rapids. Going farther? Masstimes.org can help you find the Holy Liturgy at your destination! To Strive to live as a Christ centered, Stewardship community through dynamic worship, lifelong faith formation, and service to those in need within the community and within the larger Church, praying for guidance and empowerment by the Holy Spirit. All Christians are called to live out their baptismal commitment on a daily basis.